Looking for the Wednesday Wandering? Page back one and join me for a look at a couple of stories built around wolf girls. Then come back and take part as Alan and I continue our journey into the convolutions of Science Fiction. JANE: Last time I suggested we move on to a type of SF that many people think of as “hard” SF, but is actually not. By that, I mean Space Opera. ALAN: How does that definition tie in with the conclusions we came to about hard SF? JANE: It doesn’t, but the problem faced by many of us who love SF in its myriad forms is that non-readers of SF are most likely to be familiar with SF from visual media interpretations of the worst form of space opera. In other words, these people think that space opera is hard SF and we SF readers are so stupid that we really believe all the Buck Rogers stuff is possible. ALAN: That does indeed seem to be all that the visual media are interested in – ever more spectacular special effects at the expense of the story. Who needs a sensible plot when you can blow up gigantic space artifacts? JANE: Once upon a time, you mentioned to me that you didn’t like space opera. So, what form of space opera is it you don’t like? ALAN: I think it is epitomised by the kind of books that E. E. “Doc” Smith and Edmond Hamilton were writing in the early decades of the last century. The stories were full of spectacle and glamour (and extraordinarily bad science – but we’ve already agreed that sense of wonder is the trump card which makes that less than significant). However, the plots were so childishly naive and the characters were so thinly drawn that I find the books unreadable and dull. Unfortunately, all too many practitioners of the art have fallen into the trap of thinking that space opera is characterised only by its gigantic themes and they seem to spend little time concentrating on the more mundane aspects of the writing art such as character development and plot. Harry Harrison satirised this kind of thing to hilarious effect in his novel Star Smashers of the Galaxy Rangers. JANE: But it doesn’t have to be that way… Jack Williamson’s Legion of Space stories gained richness – and better characterization – from his drawing on literary influences such as the Three Musketeers and Shakespeare’s Falstaff. ALAN: Quite right! One of the reasons that I find it so hard to think in categories is that there are always exceptions that prove the rule. Even though I say that I don’t like space opera, what I really mean is that I don’t like any kind of story that neglects plot and character. I’m more than happy to read and enjoy space operas that don’t conform to the cliché and my favourite would probably be James Blish’s Cities In Flight novels which are space opera by any definition you care to apply – in the last novel in the series he destroys the universe and creates several more, and you don’t get any more space opera-ish than that! However, at the same time the books have complex plots and fully realised characters. They make many interesting points about politics, sociology, economics and the dynamics of very large projects – I’m sorry if that makes them sound dry and dull; trust me, they are anything but that. There is a true richness and depth to the books that makes me return to them again and again. I must have read them a dozen times or more. Blish was always a subtle writer even when he was dealing with surface drama and spectacle. JANE: You mentioned Cities in Flight a while back in another context. I just finished reading them over Christmas. I loved them! Another author who did a great job with space opera elements is Clifford Simak. He never tried to explain how his ships worked or how the robots functioned. That wasn’t the point. The ships were to get us “out there” and the robots… Oh! No one has ever done robots like Simak. Robots who become monks and try to figure out the human need for religion (Project Pope is just one example), robots who keep the candle of human culture and history burning long after humanity has abandoned being human (City). Wonderful, exciting, lovely stories that you find yourself thinking about long after. ALAN: I never thought of Simak as a space opera writer before, but I can see exactly what you mean and mostly I’d agree. He was a brilliant writer with a unique voice – we could almost do a whole Tangent just about Clifford Simak! 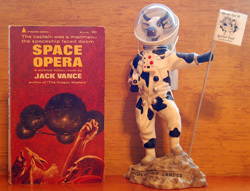 But, without a doubt, the very best space opera I’ve ever read is a truly hilarious novel by Jack Vance. It’s called Space Opera and it is about an opera company which tours space and performs Fidelio, and Cosi Fan Tutte, and Tristan und Isolde to largely uncomprehending and very bewildered alien audiences. It’s an utter delight from start to finish. JANE: Oh, boy… That sounds like another one to look for. My reading list grows. These days much of what is referred to as space opera has a very military aspect. In fact, “Military SF” is considered by many to be its own category. Next time, let’s expand our look at Space Opera that direction. This entry was posted on January 17, 2013 at 1:00 am and is filed under Thursday Tangents. You can follow any responses to this entry through the RSS 2.0 feed. You can leave a response, or trackback from your own site. For a slightly different take on the operatic end of space opera, see Glen Cook’s Shadowline, which set out to do Wagner’s Ring des Nibelungen in space (and did a pretty good job of it, too). Hmm. I liked E.E. Smith, and here’s why. My parents (both engineers) loved E.E. Smith in grad school, because they figured he was writing a humorous parody of real engineering. After a long day of having stuff go wrong on the work bench, they found a great deal of pleasure in reading about crazy projects that worked right the first time, rather than requiring years of costly R&D, about lab mistakes that made great breakthroughs (cf. the Skylark series) rather than costly messes, or projects that went from idea to prototype in the time it took some bigwig to walk across his office and pick up the phone. They knew it wasn’t real life, but they were looking for escapist reading, not realism. Their grumble was that writers who copied Smith didn’t get the joke, and thought that was how engineering was supposed to actually work. Unthinking copies of parodies do get annoying, and in that I absolutely agree with Alan. When I got into the books (not long after seeing the first Star Wars movie), my parents told me this wasn’t real, and so I just had fun with them. Even today, I think Smith’s Lensman books could be filmed well if they were done with a lot of humor, a knowing wink to the audience that this isn’t supposed to be the way things actually work. Well, the humour is right there in the books, so that wouldn’t be a reach. I read the Doc Smith books with great enjoyment in their first reprintings (contemporaneously with my still reading comic books); today I’m afraid I’d find them a little harder to read. I’ve also read some early John Campbell who wrote exactly the same kind of purple prose space opera, before he moved on to other kinds of writing (and editing). But you can find good and bad examples in absolutely any category: space opera, military SF, etc. But it’s still hard to explain to newcomers who say they “don’t like sci-fi” (based on one thing they may have read or seen) that there are many, many kinds. Incidentally, a surprising amount of “that crazy Buck Rogers stuff” has actually come into being. Something that modern readers don’t grasp about the work of people like Hamilton & Smith is just how much empty space there was in physics and its close cousins in the ’20s. And how much more in the softer sciences. There was, literally, a handful of people who could work with general relativity, and maybe 3 handsful in quantum theory – they were still inventing quantum mechanics when Hamilton started writing. It wasn’t at all evident that general relativity and quantum field theory, between them, allow a reasonably complete accounting of the [so far] observed universe. They were still settling just what a quantum was, and didn’t reach a consensus on what quantum mechanics _means_ until… well, I’m going to stick my neck out and say that a consensus on the meaning of QM will be reached by AD2250. What that means is that a lot of what went into, say, Skylark was little more speculative _then_ than a warp drive is now. There was room for a Bergenholm in physics. For that matter, it was almost reasonable to imagine a significant chunk of the asteroid belt was made of antimatter. These things weren’t just thrown in for the Wow!, and I don’t think it’s fair to say that they need to be trumped by anything. They just need to be understood, just as Jane is going to need understanding 80 years from now. OTOH, the Idea was definitely the hero back then. It’s really hard to argue that Idea has much in the way of character. With no character to write about, what do you want? Since I like dropping dragons into the middle of dark matter and calling dark energy chi, I’m guilty of this too. After all, when physicists say that they don’t know what 96% of the universe is made from or powered by, that’s an open invitation to write “here be dragons” (or whatever your pleasure is) on that part of the map and make it fantastic, in my opinion. As for the reconciliation between quantum mechanics and general relativity, it’s on a Black Swan breakthrough plus thirty years schedule. I’m not paying enough attention to physics to know if anyone has come up with a decent reconciliation of the two, but even after that breakthrough takes place (unpredictable as it is), it will take a decade or more for it to be tested, plus another academic generation after that for all the naysayers to retire and the breakthrough to become common knowledge. As for when such a breakthrough happens, I’d guess before 2130, if at all. The reason for that is that the global human population is predicted to peak between 2050 and 2100, and I strongly suspect it will decline thereafter (if we even make it to ten billion in the first place). If you need an improbable mutant genius with the just the right combination of inspirations to make the critical conceptual breakthrough(s), it will most likely happen when there are the maximum number of young people around, communicating with each other all over the world. In a weird way, we are living in the age of maximum discovery. While I don’t believe in Kurtzweil’s Singularity, I do think that it’s easier to make scientific discoveries now than it ever was, and I’ll bet that it will get progressively harder to make fundamental breakthroughs into the future, for a variety of environmental reasons (fewer people, less energy, and a more unpredictable climate causing more natural disasters). Actually, it’s already been shown that you _can’t_ reconcile QM & GR: the theoretical structures are incompatible. This is a major problem, since both have been shown to be extremely accurate descriptions of the phenomena that fall within their respective domains. There are a number of ways of building a quantum theory of gravity, but either they have to be scrapped because they disagree with GR, or they generate exactly the same observables from completely different starting points – so you can’t choose between them! Anyway, the problem I was referring to above is the rather fundamental one of interpretation: what do the equations of quantum field theory actually _mean_. Is the correct interpretation Copenhagen? Or Many Worlds? Or something else entirely? My money is on the last one – there’s a lot of input possible from elsewhere in metaphysics that has been resolutely ignored so far in the debate. Thanks for the recommendation of titles. One reason Alan and I started doing these is that it gave us a structure in which to talk about books we liked and why. The point about remember _where_ science was at the time a specific book was written is also crucial. Can anyone remember the title of the book where a nuclear explosion unfolds so slowly that people can take action during it? At the time it was written, this was considered quite possible.